I have posted my gnocchi adventures before but this time I used a new technique, using the back of a fork to hand press your gnocchi shape. (See video update below) It is not a requirement to roll it like this, as you can just simply hand cut your gnocchi and be done, but the fork tines do make a nice traditional gnocchi indentation. Making gnocchi is hard work but it is well worth the delicious result, especially paired with my pistachio alfredo concoction. Pistachio alfredo is a yummy treat we ate when we lived in Sicily, they used what they grew around them at the little farm agiturismos we went to, so pistachio was a plentiful ingredient in many dishes. Something about the rich soil from the volcanic eruptions of Mt. Etna made the vegetation grow like crazy in Sicily. 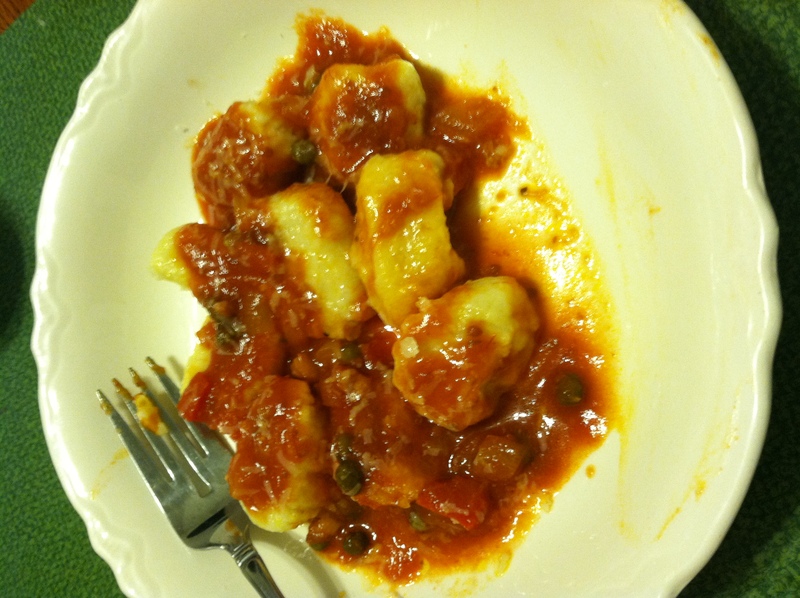 I usually double the gnocchi recipe to feed my family of four, the gnocchi is not a large serving even with it doubled, but it is very rich and filling so you don’t eat a giant bowl. 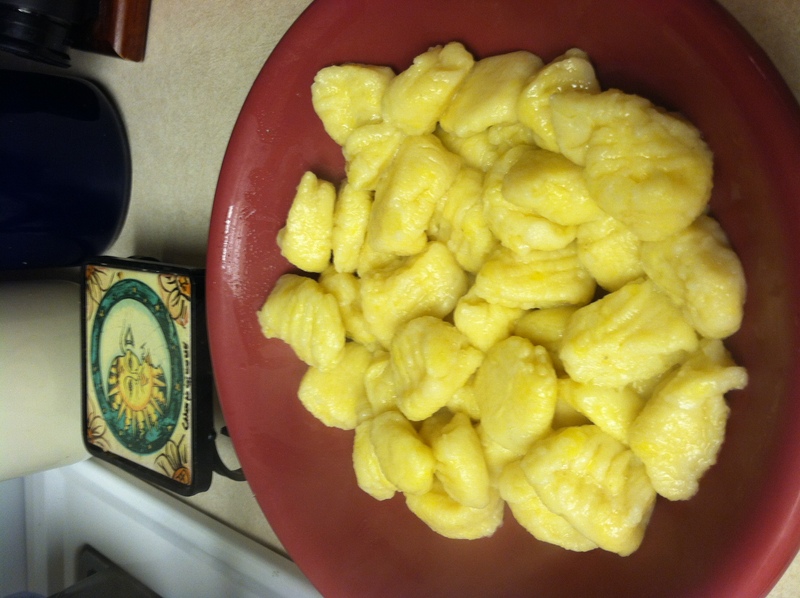 1) To make the gnocchi: Bake or microwave the potatoes until soft (do not boil as the potatoes absorb too much water). Peel the warm potatoes and press them through a ricer, or mash them; measure out 1 ¼ cups potato; enjoy the rest as you see fit. 2) Mix the baking powder with the flour, and sprinkle over the potatoes. 3) Add the cheese, yolks, salt, and nutmeg, mixing just until everything comes together in a smooth ball. 4) Place the dough on a floured work surface, cover, and let it rest for 30 minutes. 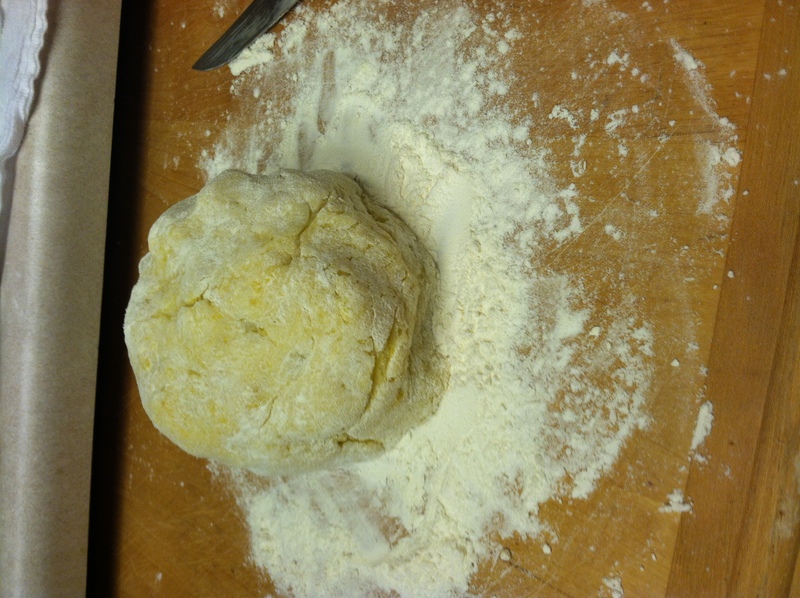 5) Take about a third of the dough, and roll it into a rope about the thickness of a finger. 6) Cut ¾”-long pieces. Using a gnocchi board, or the back of a fork, roll the individual gnocchi to create ridges on one side, and a little space in the middle. 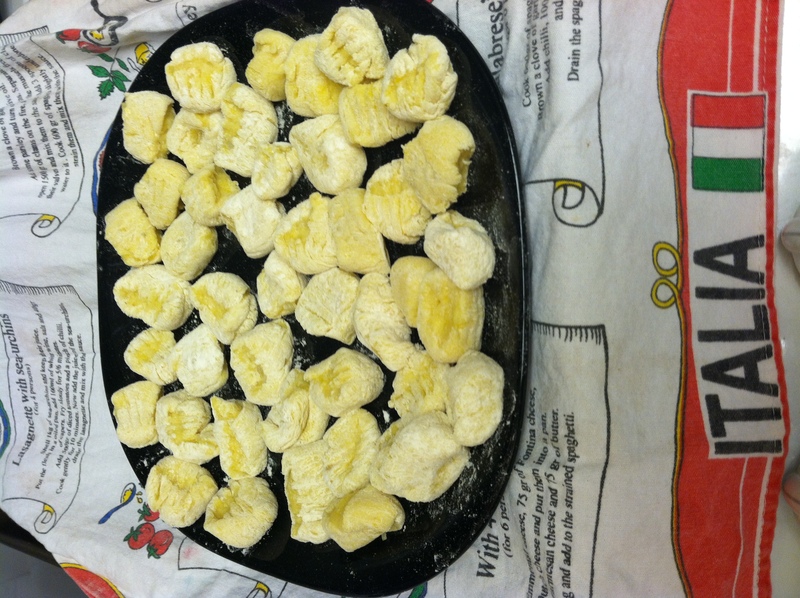 7) Place the gnocchi on a parchment-lined baking sheet dusted with flour, cover lightly, and chill until ready to cook. Gnocchi may be stored in the refrigerator up to a day, and in the freezer for several months. 8) To cook, bring a large pot of salted water to a boil. Reduce the heat to maintain a slow boil, and add the gnocchi. 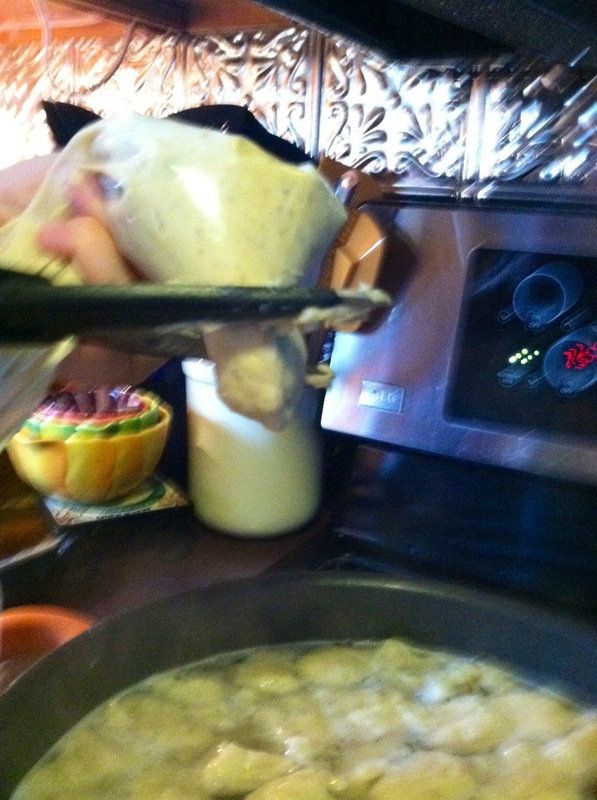 9) Once gnocchi float to the surface, cook for 4 to 5 minutes. Drain cooked gnocchi, and toss with sauce. 10) For the Alfredo, melt butter and add minced garlic, then add cream over medium heat until it starts to slowly bubble and thicken. Then stir and keep simmering until the sauce is reduced in volume by about a a third. Add the cheese and stir until all the cheese melts and the sauce becomes smooth, add salt and pepper to taste (I don’t need salt usually because butter and cheese have salt) then add ground up pistachios and stir it in to thicken sauce. 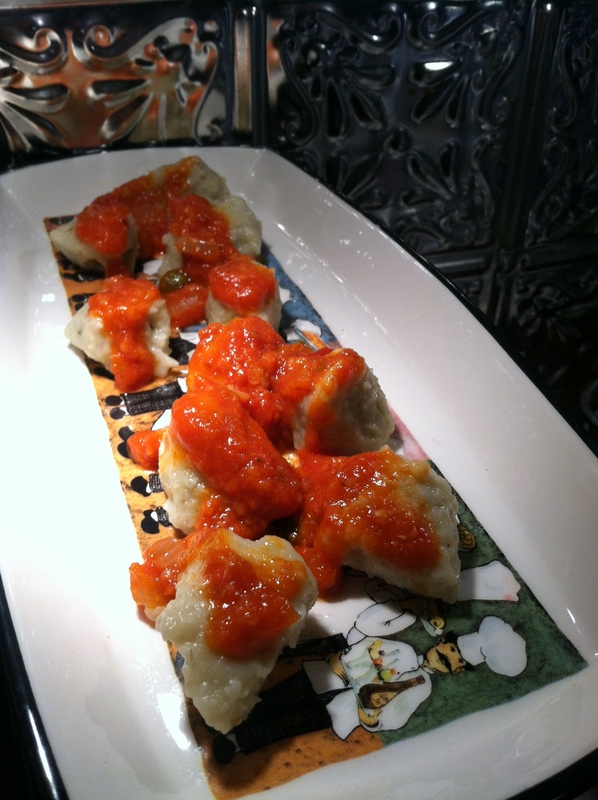 12) Toss with pasta and sprinkle servings with pepper and more cheese if you like.